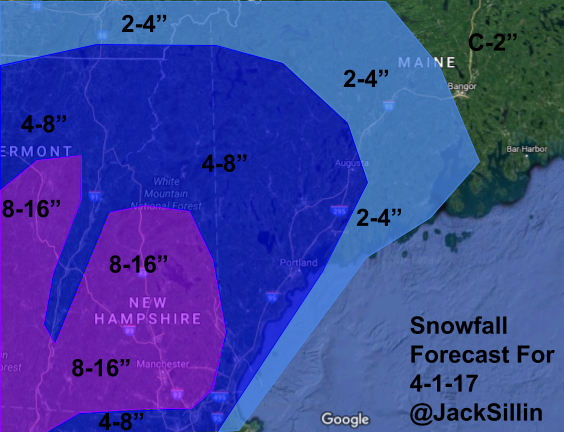 Just wanted to put out my thoughts for snowfall accumulation for tonight/tomorrow’s storm. Snow will slowly advance today and will become heavy tonight into tomorrow morning before tapering off tomorrow evening. Snow will be extremely heavy and wet so watch for power outages and shovel and inch or two at a time. More tonight/tomorrow morning depending on my schedule. Today will feature cool and calm weather as high pressure digs in ahead of our next storm system. Look for clouds to slowly increase through the day and snowflakes currently falling over SW NH to make their way NE very slowly. It won’t start snowing in Portland until the late evening. As for temps, evaporational cooling in a dry airmass will keep SW NH temps in the mid 30’s while much of the rest of the area will rise into the upper 30’s. It’s likely to be a bit cooler in the mountains as well. I’ll release a short little discussion on the storm along with a snow map in an hour or so. Today’s forecast is pretty straightforward as cooler air continues to filter into the area, the powerful spring sun will warm temps into the mid to upper 40’s for most with a few low 50’s in SW NH. Skies will be mainly sunny with light NNW breezes. Those NNW breezes will set the stage for a pretty strong late season snowstorm that’s set to begin Friday night and continue through Saturday afternoon. Up to a foot of heavy wet snow is becoming more and more likely for parts of SW NH with over a half foot likely for much of the rest of NH as well as SW ME. Winter’s final stand looks to be a pretty good one, so gear up! It’s not over til it’s over! Today will feature clearing skies and warming temps but only after we sit through some morning fog and freezing fog, depending on your local temps. This should burn off by lunchtime or earlier leaving partly to mostly sunny skies for the afternoon hours. Highs will range from the upper 30’s north to the mid 40’s south. Don’t forget though, snow is on the way for Saturday! Just wanted to pass along a little graphic I tweeted out this evening with a few thoughts on the potential for snow on Saturday. It’s a bit more technical than what I usually post but I know some may find it interesting so here’s a quick look “under the hood” of the forecast. I’ll provide more details as I figure them out this week but know snow is definitely a possibility for Friday night into Saturday! Images from Alicia Bentley and Weatherbell. Click to enlarge. Temps are a hair below freezing for most this morning which means that all of yesterday’s melt/rain has a nice slippery coating of ice this morning. Be careful as you’re heading out the door this morning! Temps will quickly warm up into the mid 30’s north and mid 40’s in SW CT with 40 degrees most likely in between. Skies will be cloudy but mainly dry with the only chance for light showers being later in the evening. Today will feature a plethora of precip types as warm air tries to push into the area. Look for the southern immediate coast to get the rain, the coastal plain and foothills to get the freezing rain, and the northern mountains to see the sleet/snow. Slick roads for everyone! Use a little extra caution if heading out this morning with all the frozen precip. Rounds of light to moderate precip will continue through the afternoon hours while temps slowly warm up above freezing for everyone except the mountains. Highs along the coast will get up to around 40 while highs in the mountains will stay just below freezing.